The holidays are upon us – it's a time of good music, good cheer and... gift-giving! People enjoy giving – or receiving – music-related gifts, so I thought I'd make everyone a little laundry list of some items that have come to my attention in the last year, such as new-release recordings and music. Please feel free to use the comments section below to add to this list! 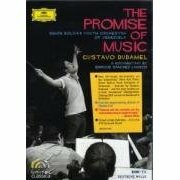 Here is a new documentary about conductor Gustavo Dudamel and the Simon Bolivar Youth Orchestra of Venezuela, released in October by Deutsche Grammophon (you may have seen some adverts on V.com for this one). This one will make your teacher misty-eyed; maybe it would make any lover of classical music, education, orchestra...misty-eyed. I watched the whole thing (which is in Spanish, with subtitles) and I loved it, just as I love Tocar y Luchar by Alberto Arvelo, which was about the same subject: Venezuela's remarkable system of music education and youth orchestras, called "El Sistema." After watching the entire thing, my husband Robert turned to me and asked, "Which do you think is more impressive, the fact that El Sistema has exposed so many children in Venezuela to music, or that it produced Gustavo Dudamel?" I couldn't answer. When I interviewed Mark O'Connor I listened to a lot of his recordings, and any of those would make fun gifts. But Crossing Bridges, his album of fiddle tunes (including an arrangement of his Appalachia Waltz) with violist Carol Cook and cellist Natalie Haas, was actually the one that remained in my car stereo for weeks on end. This is the juicy stuff to me, the small-scale jam session with true fiddle tunes. Here's another idea of a gift for someone: just download some of Mark's arrangements! I downloaded Blackberry Mull – what fun! Steve Lopez writes for the LA Times, and very often his column is the only thing I care to read, now that newspapers are cutting their editorial staff to the bone. 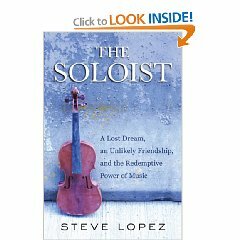 Years back, while hunting down material for his next column, Lopez met Nathaniel Ayers, a Juilliard-trained violinist who was wandering LA's Skid Row, homeless and mentally ill, playing a fiddle with two strings. A friendship evolved, this book evolved, and as with any good story that evolves in LA, the movie's not far behind. I read the book; a good read. Though I'm not sure that re-kindling the dreams that drove someone off the edge is the best "cure." 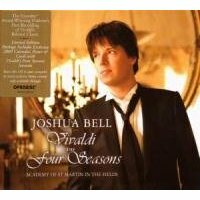 Joshua Bell's recording of "The Four Seasons" by Vivaldi. This is the kind of gift I'd give my dad. Most people have heard of Vivaldi's "Four Seasons,", but quite honestly, not as many have listened to the entire concerto, which has much more depth than people give it credit for. Bell's recording with Academy of St.Martin in the Fields, released in September, features a performance with both taste and originality. The CD also includes Tartini's "The Devil's Trill," and is attractively packaged, with nice liner notes. It's a release from last year, but I'd still give it as a gift this year. I love the way Rachel Barton Pine resurrected the music of this Victorian era performer and made it her own. It's the kind of CD that my musical Muggle Mom would like, but that also appeals to me for its scholarship and its feminist implications, not to mention that once I start listening to it, I tend to just keep it on. You can hear sound samples from this album right on Rachel's website, it's the background music. 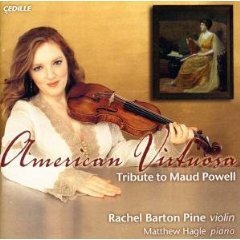 Also, this year Rachel Barton Pine released a recording of the Beethoven and Clement Violin Concertos, another fine pick for the holidays. She shared with us the story about these two works a earlier this year. Would you like some holiday tunes for the big party this year? The energetic show group Barrage, which includes V.com member Jason Hurwitz and has sort of an electric fiddle/rock vibe, just released an album of holiday tunes, and you can hear some samples on their Facebook page. 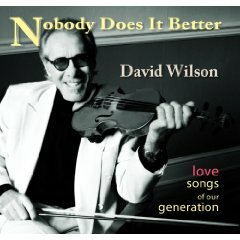 My baby-boomer aunts will totally dig the easy-listening album, "Nobody Does It Better - great love songs of our generation," released several months ago by V.com member David Wilson. Who would know how to do easy listening better than a former soloist with Henry Mancini? He's put together songs like "Killing Me Softly," "Something In the Way She Moves," and "Still," and done some first-class arranging for violin in soft-focus. Here's a review and also you can listen to the tracks here. 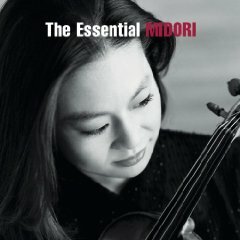 This year also saw the release of "The Essential Midori," a two-CD set which features recordings of violinist Midori Goto that range in years from 1988 through 2005 and cover many of the best-beloved violin works: five Paganini Caprices; solo Bach; movements from concerti by Tchaikovsky, Barton, Bruch, Sibelius and Mendelssohn; movements from sonatas by Elgar, Saint-Saens, Beethoven; showpieces by Kreisler and Ravel... you get the picture. It's an obvious pick for a Midori fan. But also...if you want to expose a young violin student or potential classical music fan to the range of violin classical music – or if you just want some versions of these pieces done well -- here is a nice collection. Any student who is playing, or who aspires to play, the Bach violin concertos would benefit from having this in his or her library. (By the way, Bach's Concerto No. 1 appears in Suzuki Book 7, for those of you on that track, and by this point your student best be listening to a lot more than Suzuki tapes and CDs for reference). Anne Sophie Mutter gives us recordings of Bach's violin concertos no 1 in A minor, and No. 2 in E major, as well as contemporary composer Sofia Gubaidulina's"Concerto for Violin "In tempus praesens." Here's her video promo for the album, in which you can hear some sound samples. You might consider Hilary Hahn's recording of the Sibelius and Schoenberg violin concertos with conductor Esa-Pekka Salonen and the Swedish Radio Symphony Orchestra, a recording which was just nominated for a Grammy. The Schoenberg is certainly an ambitious choice, and she spoke about her approach in her interview with Violinist.com last year. Fans of Hilary, fans of Sibelius will love this. Not everyone will love the Schoenberg, but it's an important concerto that deserves a hearing, and a place in a serious violinist's record collection. You can find some sound clips here. 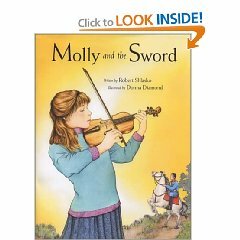 You've probably also seen some ads for this book on Violinist.com, as its author has been a sponsor over the last year. It's a children's book with lovely illustrations, set in old-fashioned times, and with the theme of courage and independence. If you always wanted one of our V.com T-shirts, here's your chance! We have limited supplies left, so check the order form before you send us a check. We've discounted them: $20 for adults, $10 for children. (Ignore the prices on the order form. Just write "Holiday Special" on the form.) We still have lots of kids' sizes! (The kids' shirts are all the white design). Thanks Laurie, you exposed me to one or two I hadn't seen. 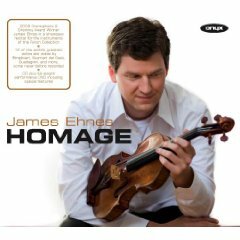 Also, thanks for that added info on the "homage" by James Ehnes. I think I'll try to get that along with some books about classical music. Off her list I can reccomend "The Essential Midori". 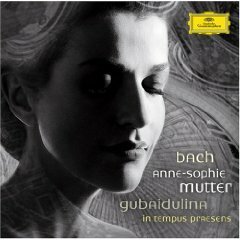 It is a very nice album and her Paganini Caprices are clean and pure; some of the best I've listened to. The concertos are also nice with the Tchaikovsky, Sibelius and Bruch to name a few. 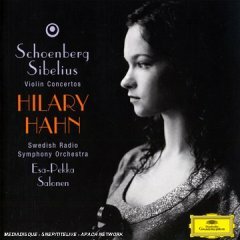 Hilary Hahn's "Schoenburg and Sibelius" is also very good. In my opinion, Hahn has the best recording of the Sibelius. I still haven't gotten around to listening to the whole Schoenberg. And the last thing I can think of is the Tchaikovsky album by Janine Jansen. It may seem like I talk about her a lot (I know I do! ), but she really is a great artist and you can see previews of the album on YouTube. Along with the album, she has also made a dvd called "Notes Of A Recording) and it's quite nice and gives a view into everything that goes on with preparing and recording. And for all those grandparents with teenagers who don't quite know what to get them, sometimes the best things are gift cards for places like sheetmusicplus.com and iTunes (if they have an iPod) it's a good resource to instantly obtain thousands of classical albums. Good luck with holiday shopping everyone! Hi Paul, Janine Jansen's Tchaikovsky recording sounds like a great addition, but I can't for the life of me figure out how you actually BUY the recording! Here is a very lovely promotional page and video, but can anyone find a place to actually order it? Aha! You can get it at Amazon UK: Janine Jansen's Tchaikovsky Concerto CD I could not find it on the Amazon U.S.
"When the world perishes, I'll go to the Netherlands. There, everything happens fifty years later." Now it's the other way around, if only for a few months.